Grande’s enhanced Whole Home WiFi - powered by eero - seamlessly blankets your home in fast, reliable WiFi. 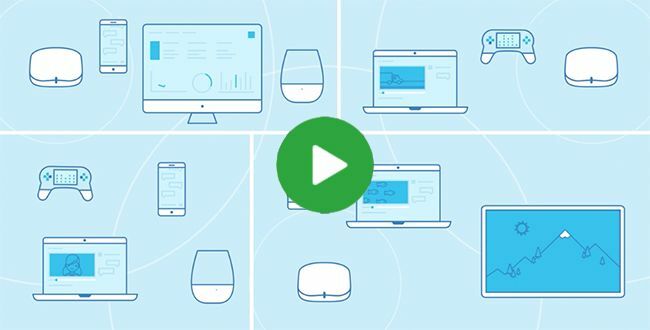 to get your eero now! You wouldn’t expect a single light bulb to light every room of your home, you can’t expect a single router to bring WiFi to every nook and cranny. Grande’s enhanced Whole Home WiFi — powered by eero — uses multiple access points and TrueMesh technology to make sure you can stream, work, and play from every corner of every room. Customize or expand your WiFi by adding as many eeros as you need. You can cover a home of any size or shape. No matter if it’s an apartment, a townhome or a single family home, Grande’s enhanced Whole Home WiFi works no matter the shape or size. Customize or expand your WiFi by adding as many eeros as you need. With the eero app, you have complete control in the palm of your hand, not hidden in a black box. See your speeds and connected devices, and check their data usage — all in real time. Set schedules, create profiles for devices or just shut the whole thing down if you want to go off grid. Grant access to friends and family or share your WiFi with out-of-town guests or your babysitter. Get system updates, security patches and more automatically. There's nothing you need to do. Normal routers require you to proactively check for and install security patches, but let’s be honest, most of us never do that. eeros protect and secure the traffic flowing over your network through advanced encryption and security protocols. Restrictions apply. Activation and installation not included. $9.95 per month includes 1 base eero and 1 beacon eero. Each additional eero beacon is $5.00 per month. For more info visit mygrande.com/wifi. All names, logos, images and service marks are property of their respective owners. © 2018 Grande Communications Networks, LLC. All rights reserved.